The Diezel modern style V212F and V412F are very tight front loaded cabinets that have quick and accurate response to the very end of their power handling curve. Designed for very Hi-Gain, 7 sting or drop tuning their linear sound reproduction is a little stiff and unforgiving when playing clean or at low volumes but is tight and focused without sloppy overtones for the really heavy tones. These cabinets cut very well through band mixes even at high distorsion and volume. Precision built in USA from imported poplar light ply with black tolex standard, black grillcloth standard and no piping. Available with either Diezel V12 speakers or Celestion Vintage 30 speakers. 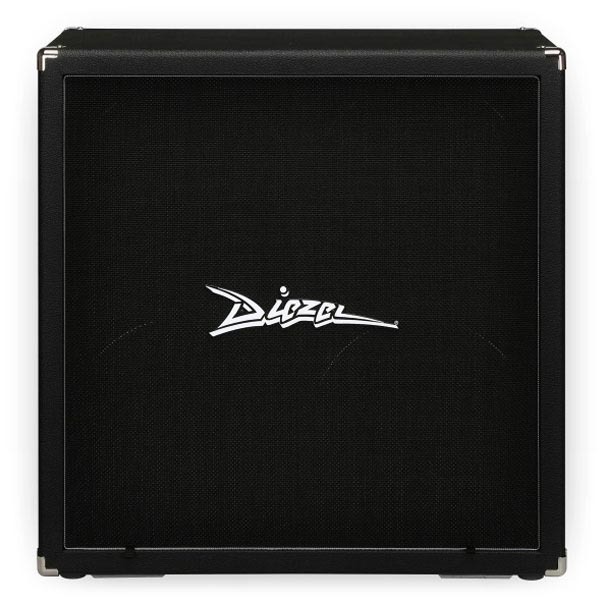 The Diezel classic style V212R and V412R are classic rear loaded cabinets that are tuned for the familiar "Classic Rock" tone yet are capable of handling high gain at high volumes without the muddy bass of regular cabinets. These cabinets are less stiff sounding than the modern front loaded design for a slightly more resonate tone and response. Precision built in USA from Baltic Birch with black tolex standard, Silverblack grillcloth standard and siver piping. Available with either Diezel V12 speakers or Celestion Vintage 30 speakers. The Diezel V212R-NYC and V4X12R-NYC reproduce Vintage "Classic Rock" tone and captures the sound of the late 60s 4X12s while slightly tightening the bass, improving the response and providing better articulation. These cabinets are carefully built in the USA from void free baltic birch with meticulous attention to the important details that affect vintage tone. They are tuned for classic sound reproduction and are warm and fat sounding with rich harmonic complexity and woody resonance. Black tolex, silverblack grillcloth and siver piping are standard but option tolex colors, piping and authentic Salt & Pepper basketweave grillcloth are also available as options. Standard speaker choices include Celestion G12H30, G12M Greenbackand Vintage 30. Optional Choices include Celestion Heritage G1230, Heritage G12M Greenback, Heritage G1265, and Alnico Gold.